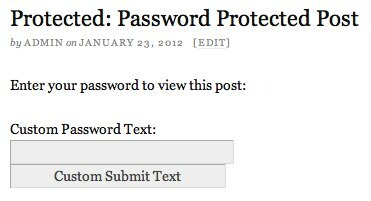 Using the WordPress filter the_password_form along with some custom code in your Thesis custom_functions.php file, you can modify various text elements in the password form. You can change the explanatory prompt message, the label of the password field, the text on the submit button — or all three of these at once. Note that, in each of the following examples, the $after variable is what determines the replacement text — simply replace the example text contained inside each pair of single quotes with your own desired text (be sure to retain the single quotes themselves to avoid triggering a PHP syntax error).